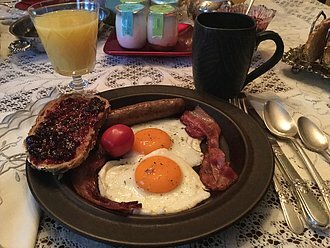 This is our classic cooked to order breakfast. 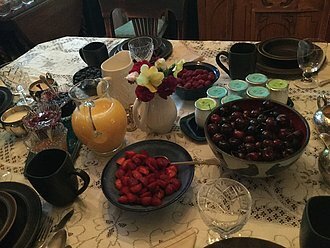 The jams are homemade on site, using local organic fruit, the bacon and sausage come from Gelderman's farm, the eggs from a variety of organic farmers, the bread from Pure Bread, the coffee from Trees, Organic Coffee and the milk from Avalon Dairy. We like to know where our food comes from and who has handled it. We also prefer local and organic if possible. The fruit varies according to what's in season and available. Ashby House Welsh Cakes 1 cup of unsalted butter I cup of white sugar 2cups of white all purpose flour 2tsp. fbaking powder 1/2tsp. ground nutmeg Pinch of salt mix ingredients together with pastry blender until they form crumbs then add a cup of currants or raisins and currants mixed. Beat two large eggs until frothy then add 4tbsp. of milk or cream. Add 1tsp. Vanilla mix together. Make a well in the first mixture and pour in the liquid and mix until blended. It may be sticky, but that's fine. Take 1/3 of the batter and place it on a floured surface. You can add enough flour to be able to pat the dough flat, to about 1/4 inch thick. Cut into 2 inch rounds. Heat a heavy griddle or frying pan to medium low heat. Place the rounds on the pan. Watch carefully as the time between golden brown and dark brown is seconds. When one side is golden brown turn over and cook the other side. The time varies depending on size of round, thickness and heat of pan. Try one to test what works best. Cool on rack. 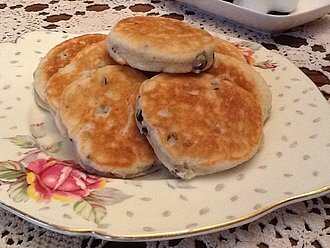 Welsh cakes are great warm or cold, for breakfast, tea or any time. They keep very well in a tin, freeze and are good plain, with butter, jam or honey. We let you choose from a selection of seasonal fruit, yogurt, hot or cold cereals, bacon, sausage, eggs any style, multi-grain or specialty breads, homemade jam or marmalade, organic, fair trade coffee, teas both English and herbal or hot chocolate. All food locally sourced, organic where possible and cooked to order. With notice we cater to special diets and preferences. We believe that life is too short not to eat well. In 1/2 cup warm water, add 1 tsp.sugar and 1 package of yeast. warm 2 cups of milk,add 1/2 cup of melted butter and a pinch of salt. In a large mixing bowl add two cups all purpose flour and stir well. Cover and let sit overnight at room temperature. The batter will double in size. Just before cooking the waffles,beat in two eggs and add 1/4 tsp. of baking soda. Stir until well mixed. Pour 1/2-3/4 cup of batter into hot waffle iron. Bake until golden brown and crisp. 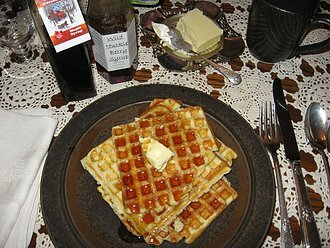 These waffles are not sweet and can be used with syrup or as a base for scrambled eggs, etc. They freeze well and can be re-heated in a toaster and the batter keeps for several days in the refrigerator. 1 cup unsalted butter, 3/4 cup brown sugar. 1/2 cup white sugar: cream butter, add sugar mix well. Add 2 eggs(beaten), 1 tsp. 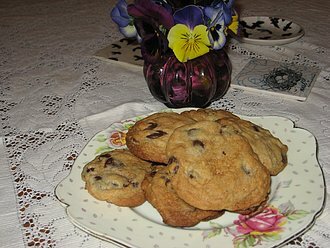 real vanilla,pinch of sea salt and 2 cups of Belgian chocolate chips and 2 cups of all purpose flour. Mix together until the flour no longer shows. Spoon onto cookie sheets. Makes 2 doz. large or 3 doz. medium cookies, though my Granny claimed it made 4 dozen. Perhaps if no one eats any before they are baked. Bake in a 350F. oven for 10-12 minutes or until golden brown.